Removals Company Dorset, Woods Removals Ltd. When you’re moving house, you need a company that cares and that treats your move with diligence and forethought. We’re a removals company in Dorset that does just that and more, with 140 years of work behind us and many hundreds more to come. We’re determined to bring you all the expertise and knowledge we’ve accrued – all of our team have a combined 60 years of experience and we’ve pooled our know-how and come up with a stress-free way of getting people out of their old homes and into their new without glitch or hassle. We’re a BAR-accredited (British Association of Removers) establishment, with a vast array of solutions to pretty much every known moving problem. Since we move clients on a daily basis, we know the area incredibly well, which diminishes time spent in transit. Packing, wrapping, handling and unpacking – we do all of these things, including the dismantling and reassembling of complex furniture items and grand pianos. And whatever the shape and size of your move, we can take it on. From start to finish, your property and its contents are treated with unfailing care and consideration, with a professionalism that’s not always easy to find. Removal companies in Dorset aren’t all as reliable and dependable as we are. We get the ball rolling by sending out an estimator to visit you at a time convenient to you. All the necessary information is taken down so that a detailed and clear quotation can be promptly prepared. All our estimators are knowledgable and friendly and always happy to answer questions. You’ll also be furnished with a checklist designed to help you ensure that nothing is overlooked. On moving day itself, all your belongings are protected – for example, we use specialist cardboard crates for mirrors and picture frames. Nothing is left to chance. If you need storage in Dorset, we’ve got excellent facilities, and our services extend well beyond simple domestic removals – we also provide European and international moving services, too, along with office moves. 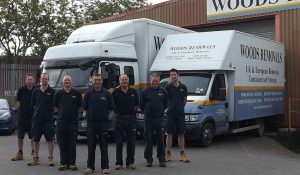 From beginning to end, Woods Removals is a quality service and you’ll notice the difference from the moment you place a call to us.